BULLYFREE Kits for Kids for your child safety campaign. Custom Imprinted - Low Cost! Statistics show that 1 out of 4 students are BULLIED. In large, school absenteeism is directly related to fears of being BULLIED at school by other students. Most students said BULLIES that pick on other students or make fun of them or BULLY them, can likely turn to violence in school. Over 1/3 of students have reported being BULLIED online, and for students that are social network users the percentage is even higher for being CYBERBULLIED. BULLYING is when someone says or does something intentionally hurtful and they keep doing it OVER AND OVER again even when you tell them to STOP or show them you are upset – that’s BULLYING! A BULLY usually tries to hurt a person OVER AND OVER again! EMOTIONAL – excluding a person from the group, shunning, spreading rumors to intentionally hurt someone, mean gossip toward others, ruining another person’s good reputation. BULLIES enjoy the feeling of power over others, and often are BULLIED themselves by others in their lives. What are some BULLYING prevention tips? Remember a person being BULLIED often feels like there is nothing that he or she can do about it. A person being BULLIED might feel smaller or weaker than the BULLY or outnumbered by a BULLY or the BULLY’S friends. A person being BULLIED sometimes may feel that there is no help or no one to talk to. A person being BULLIED often feels sad and simply does NOT know how to change the situation. A trusted adult can STOP BULLYING. Speak up and tell a teacher, your guidance counselor, parent, police officer, or an older friend. How to avoid a BULLY. Stay with friends – don’t be alone. Simply try to avoid places where you know a BULLY hangs out. Always try to stay calm, be patient, ignore the BULLY, and walk away. How to help a friend being BULLIED. You can help a friend being BULLIED by standing beside them. You can try talking to a person being BULLIED and be a real genuine friend to them. You can tell the BULLY to STOP BULLYING and speak out to help others. Avoid unkind or untrue words on the internet. Save any evidence to show a trusted adult. Block the BULLY on social media sites or on your cell phone. Always report BULLYING immediately. BULLYING is never okay. You can help to prevent BULLYING by taking action. Treat everyone with respect. Get together with your friends and try to alk to the BULLY. A BULLY should be told that bullying is not accepted at your school and that it is NOT cool. Try to show them a friendly way to interact with others. NEVER KEEP BULLYING A SECRET. Always find someone who will help in your situation to combat a BULLY. How can Fingerprint America’s BULLYFREE Kits can help? Fingerprint America’s BULLYFREE Kit can help students with BULLY prevention through an educational process that reinforces positive and ANTI-BULLYING behavior. 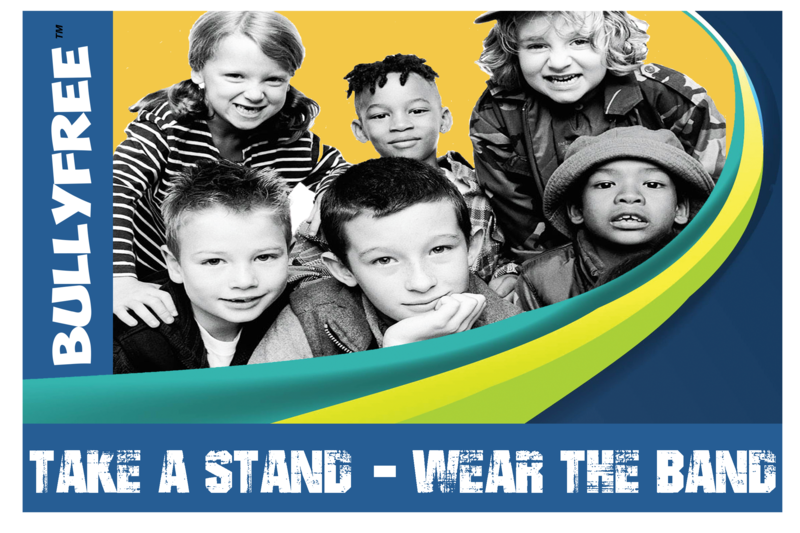 The BULLYFREE Kit includes a “TAKE A STAND – WEAR THE BAND” silicone bracelet for students to pledge to be BULLYFREE and to have a BULLYFREE ATTITUDE toward other students. Fingerprint America’s BULLYFREE Kit covers all ages of students in 2 segments and promotes BULLYFREE good behavior towards fellow students. Thus far these kits are one of the most cost-effective way for law enforcement, civic groups, companies, and individuals to participate in a program that can reach every child in our school systems to STOP the destructive behavior of the BULLY! PURCHASE the BULLYFREE KIT and you will automatically receive 50% off any other purchase of Fingerprint America’s other award-winning kits of equal or less than quantity. The discount will apply to as many other program kits as you wish to order! Purchase BULLYFREE kits to get 50% off any other Fingerprint America kits of equal or lesser quantity!